UPDATE: The family of a young woman who disappeared in southern Manitoba in freezing temperatures tells CTV News that human remains found Monday belong to Maria Pluschnik. RCMP said Monday afternoon human remains were found near Schanzenfeld, Man., located near Winkler. When contacted by CTV News, Pluschnik’s family said they have confirmation the remains belong to Pluschnik and were too upset to speak any further. Earlier Monday, RCMP said they were searching for Pluschnik, 25, whose car was found abandoned near her house. On Monday CTV News observed police gathering and searching an area about two to three kilometres from Pluschnik’s vehicle. RCMP said they continue to investigate and more information will be released when it’s available. Pluschnik was last seen on Feb. 7 in Schanzenfeld, a community in Stanley, leaving in her car, a green Dodge Caliber. RCMP in Morden, Man., were notified about her disappearance on Feb. 9 at 12:35 p.m. 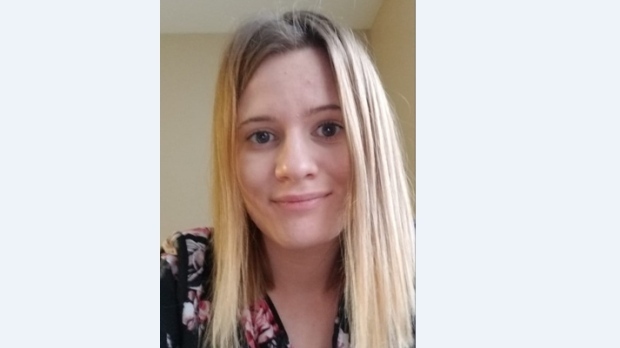 EARLIER: The RCMP are searching for a missing 25-year-old woman, whose car was found abandoned in the RM of Stanley, Man. Maria Pluschnik was last seen on Feb. 7 in Schanzenfeld, a community in Stanley, leaving in her car, a green Dodge Caliber. Police said on Feb. 10 her car was found on Road 22 West and Road 8 North, and that it looked like it had gotten stuck in a snow drift and had been there for some time. Pluschnik has long brown hair and grey eyes. She was last seen wearing a dark red winter jacket, a white scarf, boots, a toque and mitts. Eugenia Pluschnik is Maria’s mother. “I’m very worried right now,” she told CTV News in a phone call Monday. She said her daughter had been working in Winnipeg and moved back to the family’s home in Winkler on Wednesday, the day before she disappeared. Maria’s mother said her daughter told her she was going to McDonald’s in Winkler Thursday around 8 p.m. When she didn’t come home, she tried to contact her around 11 p.m. and said she didn’t answer. The family isn’t sure if she made it to McDonald’s. They reported her missing Saturday around 11 a.m.
RCMP told CTV News in an email Monday that she left her residence alone. “She had left her cellphone at home so the RCMP currently have her phone,” said RCMP spokesperson Julie Courchaine. She said her vehicle has been recovered and the RCMP’s forensic identification unit will be processing it. It was found approximately two miles from her residence. Sunday a search was conducted by RCMP on snowmobiles and with police dog services, Courchaine said. The area surrounding where her vehicle was found was searched but nothing was found. There may be another search conducted Monday by snowmobile, RCMP said. Dennis Whitman said he found a Pluschnik’s vehicle Sunday. He said at the time he didn’t look for footprints because he didn’t know she was missing. He said the vehicle was parked parallel on the road and it appeared like snow plows had been by. He reported the vehicle to police. He said the nearest house was about a 15 minute walk away. He said he has a daughter and can only imagine how the family is feeling. He hopes Pluschnik is found soon. Anyone with information on Pluschnik’s location is asked to call 204-822-5468 or Crime Stoppers.